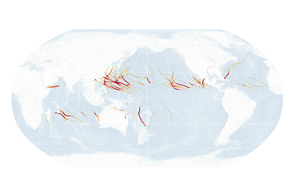 Tropical cyclones left their marks on the news pages and on some record books in 2018. They also likely left some marks where we cannot see them clearly: in the depths of the ocean. 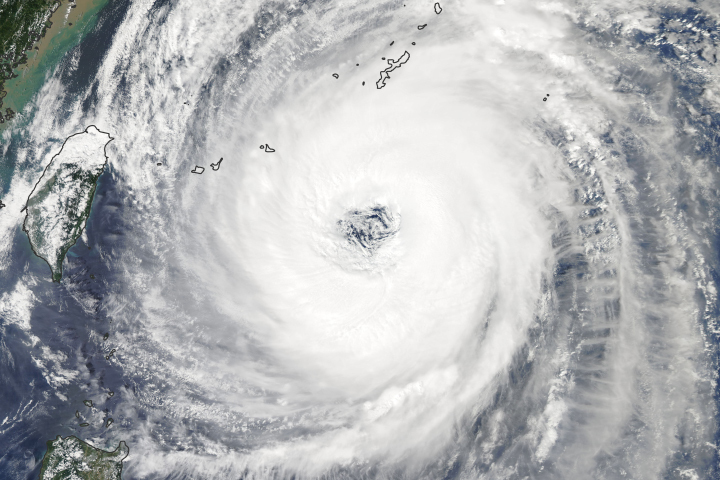 Hurricane season in the Atlantic and Eastern Pacific ocean basins officially ended on November 30, 2018, while the typhoon season in the Western Pacific and the cyclone season in the North Indian basin never really end. The seasons in the Atlantic and Western Pacific brought roughly the average number of storms, punctuated by some exceptionally strong ones. The Indian and Eastern Pacific basins saw activity well above normal. As these awesome and awful storms move across the ocean, they churn up the surface and leave swaths of cooler water in their wake. Sea surface temperatures can drop by as much as 5 degrees Celsius (9° Fahrenheit) within a day or two of a storm’s passing. 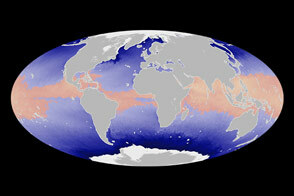 In the process, vast amounts of heat and moisture are transferred from the ocean to the atmosphere. At the same time, some of that heat is also sinking into the sea, which might have implications for seasonal and long-term climate. 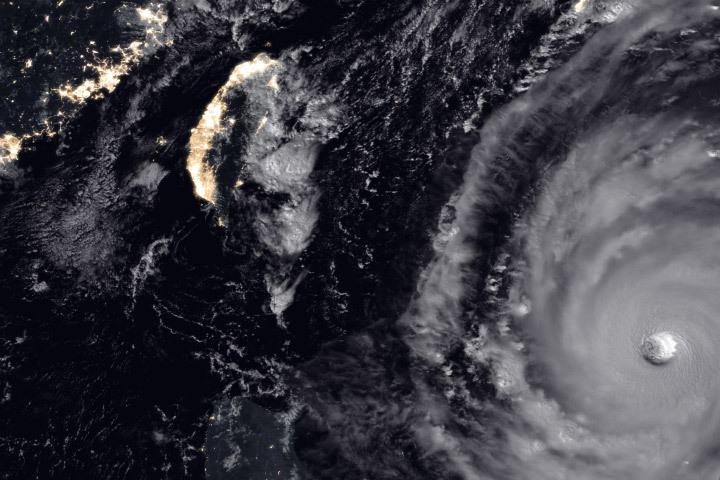 These maps show the effects of three of the most potent storms of 2018: category 5 super typhoon Trami (top), category 5 hurricane Willa (middle), and category 3 cyclone Mekunu (below). 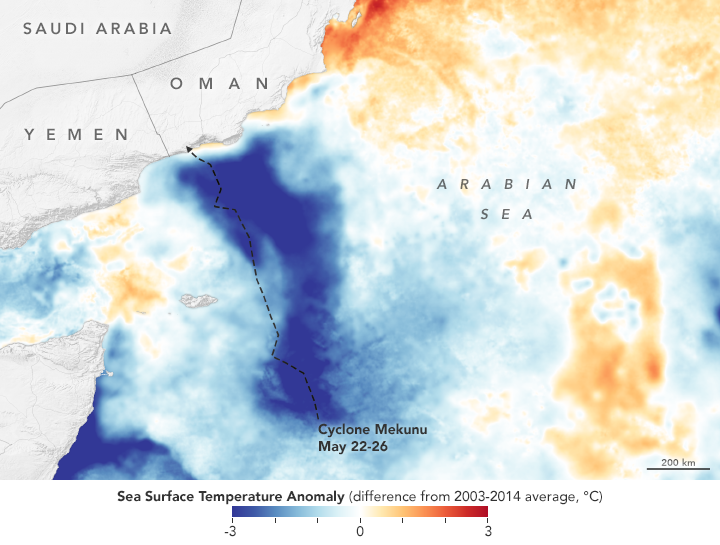 Each map shows sea surface temperature anomalies in the wake of each storm; that is, how much the surface layer stood above or below the long-term average temperature for the time of year. 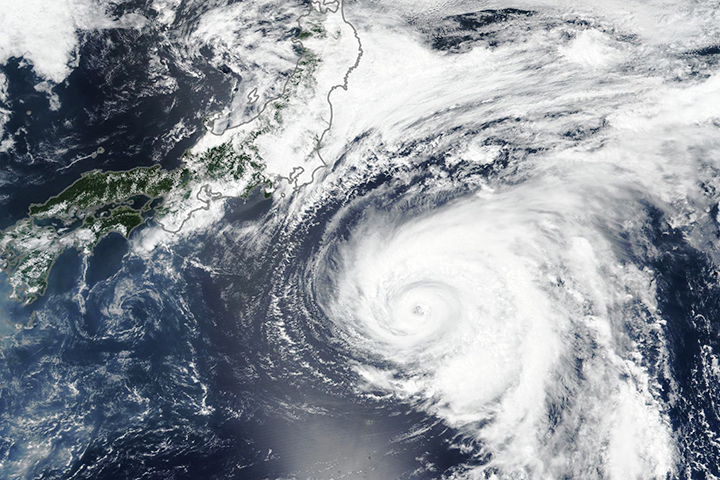 Scientists have known for some years that hurricanes and typhoons create cold wakes. As hurricane winds swirl over the ocean, they evaporate water (and with it, heat) into the atmosphere. They drive diverging currents that push warm water masses away from the storm center, leading cooler deep water to rise from the depths to replace it (upwelling). Then there is the cooling rain that falls back into the sea, and the lack of sunlight due to the thick cloud cover. All of these factors cool off the sea surface, which can slow and even snuff out the development of storms in the same area for a while. This surface cooling effect can span hundreds of kilometers across the ocean surface and typically reaches 150 to 200 meters (500 to 650 feet) down into the ocean, according to Isaac Ginis, an oceanographer at the University of Rhode Island (URI) who studies cold wakes. The more intense the cyclone, the deeper the stirring and mixing effects can be. Storms that move slowly also reach deeper. The most intense storms can mix water down to 400 meters (1300 feet). On the surface, in the top 20 to 30 meters (60 to 100 feet) of water, the cooling effects can last as long as 30 to 40 days, Ginis noted, as sunlight slowly heats the surface layer again. But changes in the dark depths can last for months, according to a study co-authored by Ginis and colleagues. Because all of that pre-cyclone surface heat has to go somewhere, it warms deeper layers of the ocean. This may have an effect on the thermohaline circulation, the great current system that moves heat and salt around the global ocean. Ginis and other oceanographers are investigating the long-term effects of this heat-pumping phenomenon. 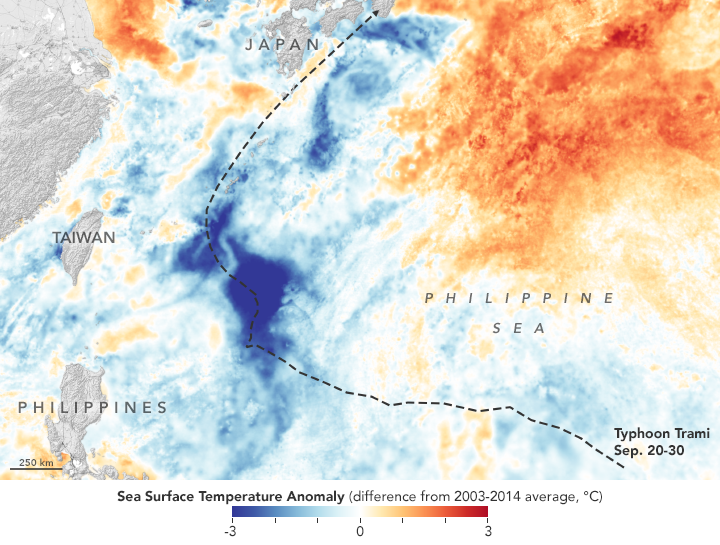 Years like 2018, with many intense hurricanes and typhoons, can drive significant amounts of heat into the ocean. But the laws of physics say it has to come out eventually. 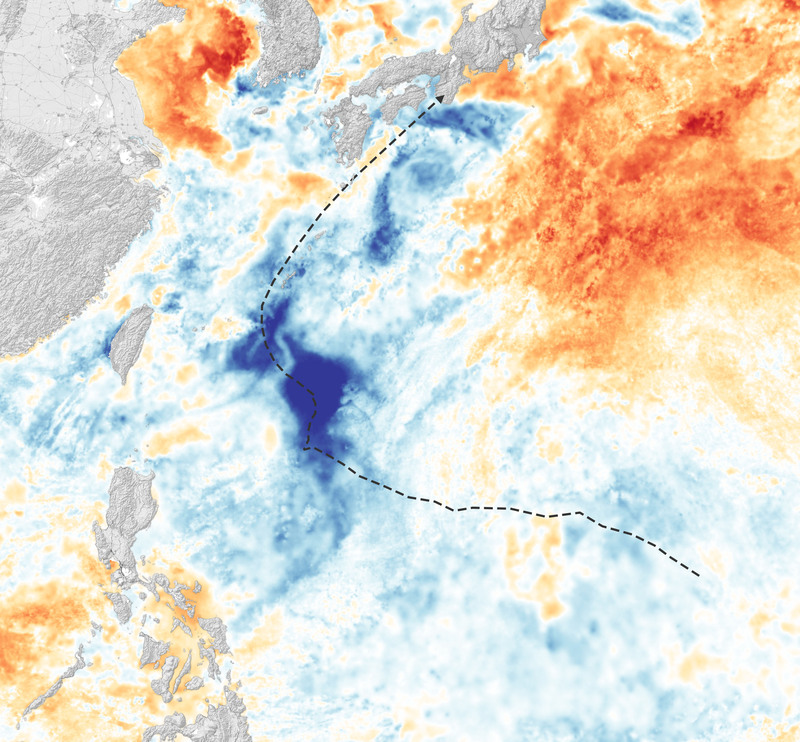 The URI research team has found some evidence that in the Western Pacific the heat migrates from the mid-latitudes back toward the equator. It may then move along equatorial currents from the Western Pacific to the Eastern Pacific. 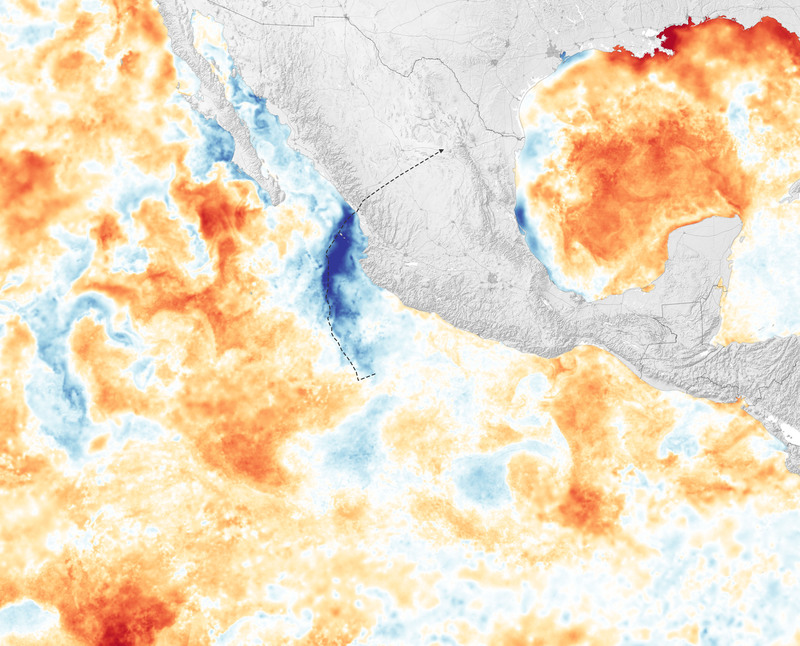 (Those currents are a key part of the El Niño-Southern Oscillation pattern.) In other cases, it may be venting out of the ocean in middle latitudes during the winter. In the North Atlantic in 2018, 15 tropical storms formed, with eight of them becoming hurricanes and two (Florence and Michael) becoming major storms (category 3 or higher). 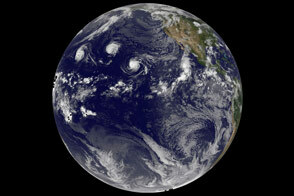 The Eastern Pacific had 23 total storms and 13 hurricanes, 10 of them major. 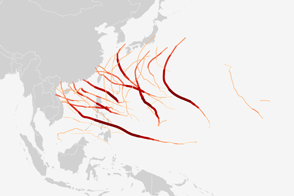 In the Western Pacific, 29 tropical storms formed; 14 became typhoons and seven of those reached super typhoon strength. 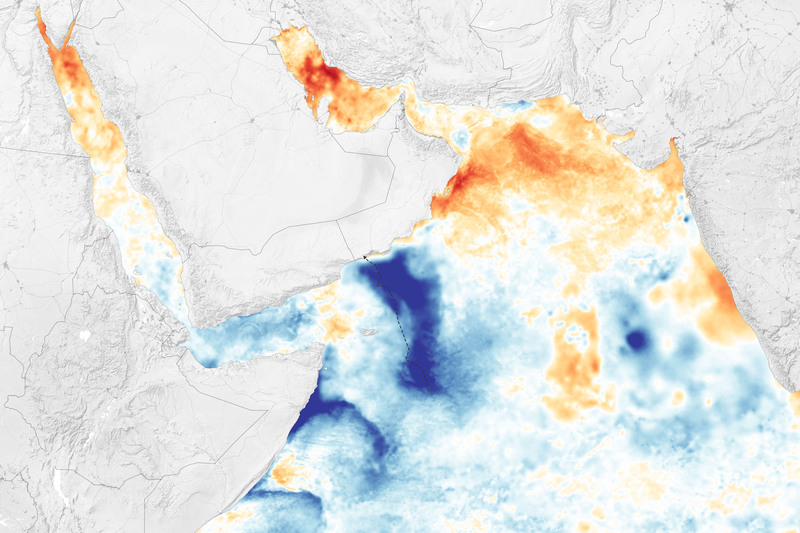 The North Indian Ocean saw its most active season since 1992, with 13 tropical depressions, with four that turned into severe or very severe cyclonic storms. All of that heat and energy had to go somewhere. 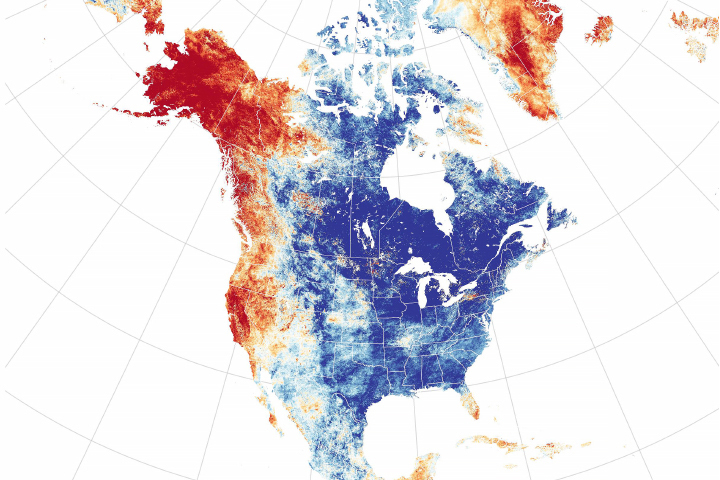 NASA Earth Observatory images by Joshua Stevens, using data from the Multiscale Ultrahigh Resolution (MUR) project. Story by Mike Carlowicz. Hurricanes and typhoons cause vast amounts of heat to sink into the sea, which might have implications for seasonal and long-term climate. Bueti, M.R. et al. (2014) Tropical Cyclone-Induced Thermocline Warming and Its Regional and Global Impacts. Journal of Climate , 27, 6978-6999. The Maritime Executive (2018, May 14) Record Ocean Temperatures Fueled Hurricane Harvey. Accessed November 8, 2018. 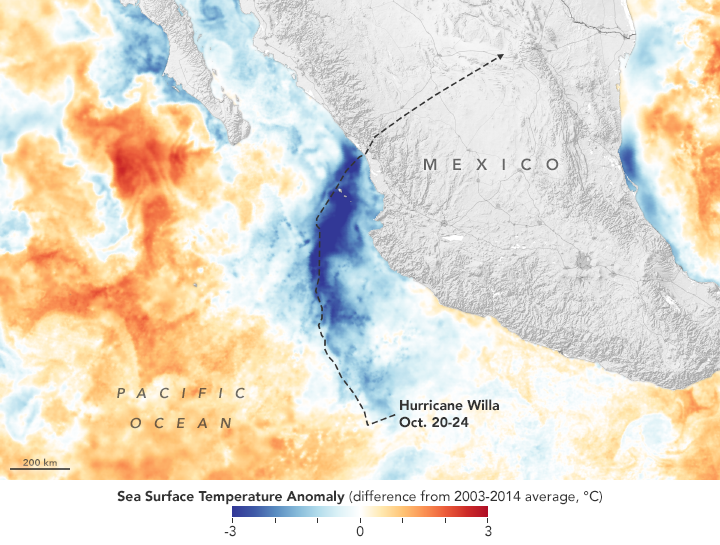 NASA Earth Observatory (2018, October 24) Hurricane Willa. 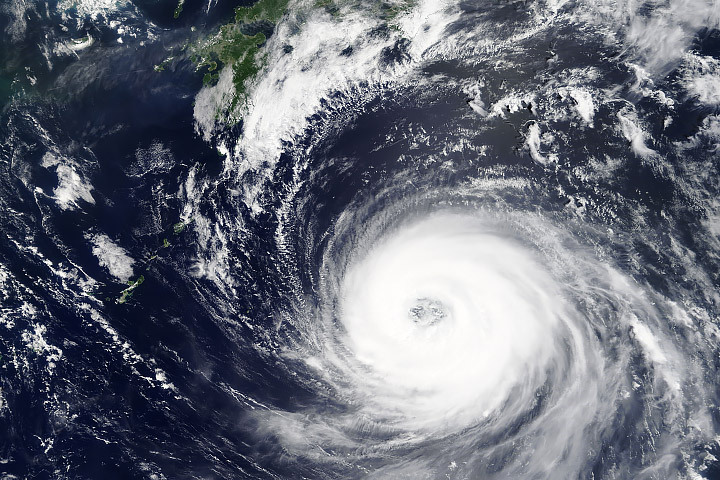 NASA Earth Observatory (2018, September 29) Typhoon Trami Takes Aim at Japan. NASA Earth Observatory (2017, September 3) Harvey Churned Up and Cooled Down the Gulf. 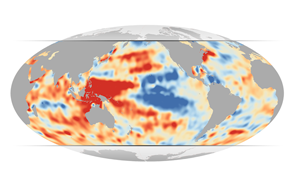 NOAA Geophysical Fluid Dynamics Laboratory (2014, November) Global Warming and Hurricanes. Accessed November 8, 2018. 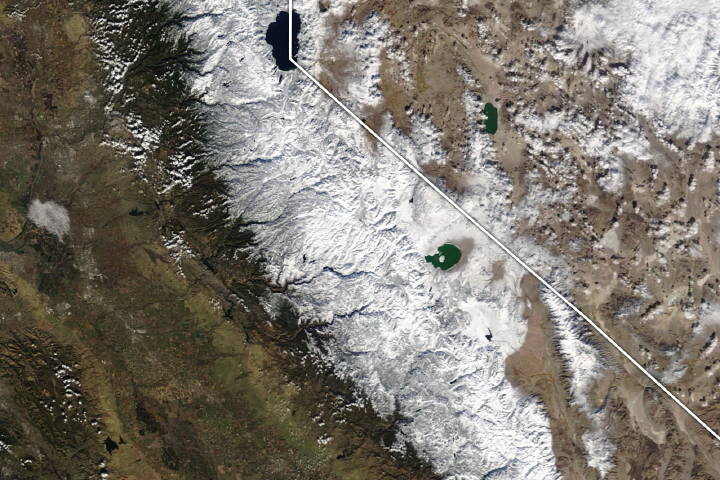 Pacific Northwest National Laboratory (2014, November) Powerful Brakes Applied by Cyclones Cold Wakes. Accessed November 8, 2018. Trenberth, K. et al. (2018) Hurricane Harvey Links to Ocean Heat Content and Climate Change Adaptation. Earth’s Future .